But their approach, which keeps cancer cells from shutting off the immune system's powerful T-cells before they can fight tumors, is just one way to use the body's natural defenses against deadly disease. A team of Vanderbilt University bioengineers today announced a major breakthrough in another: penetrating tumor-infiltrating immune cells and flipping on a switch that tells them to start fighting. The team designed a nanoscale particle to do that and found early success using it on human melanoma tissue. "Tumors are pretty conniving and have evolved many ways to evade detection from our immune system," said John T. Wilson, assistant professor of chemical and biomolecular engineering and biomedical engineering. "Our goal is to rearm the immune system with the tools it needs to destroy cancer cells. "Checkpoint blockade has been a major breakthrough, but despite the huge impact it continues to have, we also know that there are a lot of patients who don't respond to these therapies. We've developed a nanoparticle to find tumors and deliver a specific type of molecule that's produced naturally by our bodies to fight off cancer." That molecule is called cGAMP, and it's the primary way to switch on what's known as the stimulator of interferon genes (STING) pathway: a natural mechanism the body uses to mount an immune response that can fight viruses or bacteria or clear out malignant cells. Wilson said his team's nanoparticle delivers cGAMP in a way that jump-starts the immune response inside the tumor, resulting in the generation of T-cells that can destroy the tumor from the inside and also improve responses to checkpoint blockade. 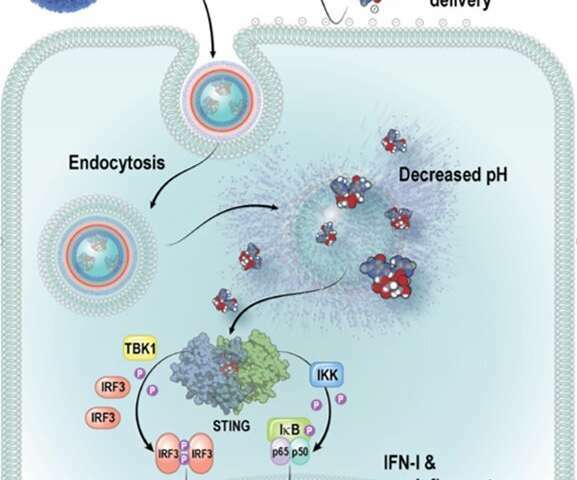 His findings appear today in a paper titled "Endosomolytic Polymersomes Increase the Activity of Cyclic Dinucleotide STING Agonists to Enhance Cancer Immunotherapy" in the journal Nature Nanotechnology. Daniel Shae, a Ph.D. student on Wilson's team and first author of the manuscript, said the process began with developing the right nanoparticle, built using "smart" polymers that respond to changes in pH that he engineered to enhance the potency of cGAMP. After 20 or so iterations, the team found one that could deliver cGAMP and activate STING efficiently in mouse immune cells, then mouse tumors and eventually human tissue samples.